The acting religious affairs minister Chakari has angrily reacted to media reports about an arrest warrant issued against him on graft charges. Many of the previous Ministers of Hajj and Aufaq embezzeled money. Was he the only honest one? 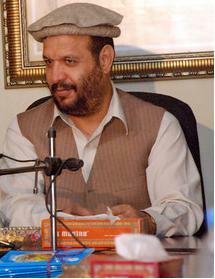 Mohammad Siddiq Chakari, born 4 August 1961 in Chakari, Kabul Province, Afghanistan, is an Afghan politician. Chakari studied at the Madrassa E Abu Hanifa until grade 12 and travelled to Saudi Arabia for further and higher education. He completed a masters degree (MA) and was a successful graduate of Islamic Studies. When he returned to his country, he joined the mujahideen and was a leader of the fight against the Soviet invasion. He also wrote and translated his book, Lizat-E-Eman, Sifat-E-Qumandaan, and Moral-e-mujahid in Persian and Arabic. He was also appointed an advisory minister to President Hamid Karzai but later resigned. Siddiq Chakari, a member of the leadership council for the United National Front party, a coalition of mostly Northern Alliance parliamentarians In Kabul, Mohammad Siddiq Chakari’s posters feature a mobile telephone. Public Prosecution Department says a commission is to be set up to investigate corruption cases attributed to Sediq Chakari and others. (20100315) Mr Chakari was replaced in a December 2009 cabinet reshuffle. He remains a long term ally of Mohammad Qasim Fahim, vice president, and Burhanuddin Rabbani, a former president and influential northern power broker. Chakari, a British passport holder, strongly denied involvement when allegations first arose. He is thought to be in Britain and has been under investigation into his alleged involvement in a kickback racket which made hundreds of thousands of pounds from poor pilgrims. Afghanistan's former acting minister of hajj and auqaf Siddiq Chakari, who is currently in London, United Kingdom, has formally been indicted in a corruption case (20100331). Prosecutors completed investigations against the ex-minister, who allegedly embezzled 360,000 US dollars in the award of a contract to a private airline to fly Afghan pilgrims to Saudi Arabia.